Meat slicers are tricky topics and because of this they aren’t always favored in the kitchen. But the truth to these appliances is that they’re very useful and convenient. If you find the right one, your time in the kitchen could be much easier with the best meat slicer at hand. For this list, the best meat slicer is the BESWOOD 10” Premium BESWOOD250 model. 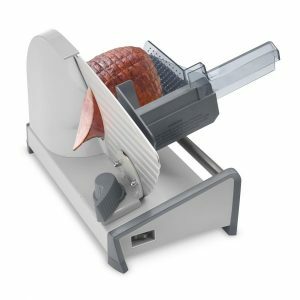 This meat slicer is a great addition to your kitchen with the features of precision, consistency, and quality with each use. This BESWOOD meat slicer is a commercial-grade product, so you can find it in restaurants and deli stores. But why not bring the deli quality to your house with this strong, durable and robust unit? It isn’t large in size, and it does the job quickly. With added safety features, this unit is safe to have around the family and easy to store away from unwanted hands. There are three types of slicers you can encounter. It’s up to you to decide which slicer is best for you. These slicers are the simplest to use, and can usually only cut through the meat. These units are also mainly manual models where there is a lot of effort on your part to keep the machine going. Many models use hand cranks, and require you to clear out space manually for your meat to come out and take their time while working. These aren’t bad options if you’re new to the whole meat-slicing business. 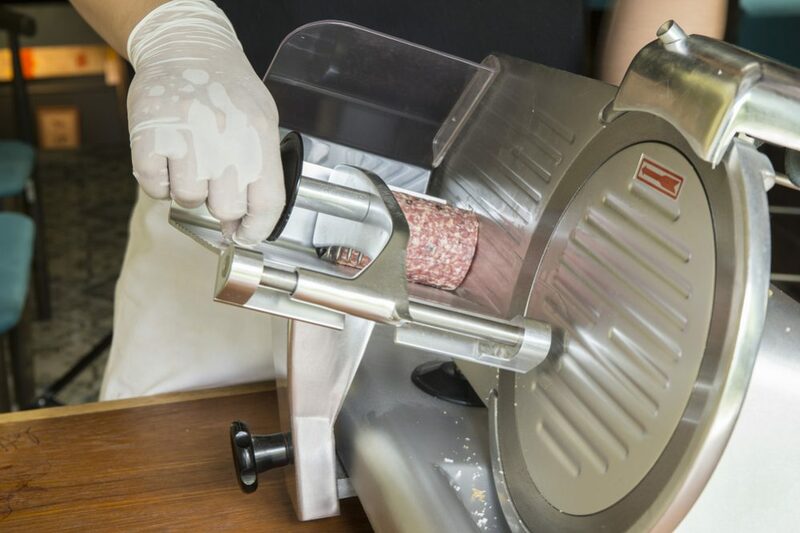 If you want to try out the meat slicer just to see if you like the idea of some help when performing this action, this is the right first step for you to make. These kinds of slicers will have larger blades and more power to them. They can have some automatic features to them which will make using them much easier. Fortunately, these middle-class slicers aren’t as big of a jump from beginners so converting from one to the other shouldn’t be too hard. Most of the slicers on this list identify as premium slicers. These slicers are made to handle heavy-duty jobs and tackle long projects, withstanding the heat and pressure that’ll develop around the blade. These kinds of machines can handle cutting more than just meat. They can also cut through cheese, bread, vegetables, and fruits as well. They can also have different types of blades inserted on them for different jobs. These machines are typically electric, meaning they’re fast with their work, are as efficient as the power source you provide them with, and offer consistent performance. For at-home use, these are ideal models since they’re quick but you still have control over the machine’s work. This Kitchener model is capable of cutting more than just meat. This slicer can cut fruits, vegetables, bread, cheese, and meat all as cleanly as one another. It cuts your meat into clean, deli- styled chops and can handle turkey, chicken, salami, steak, and more! This Kitchener model is compact and robust, easy to carry with you if you need to use it on family trips. All the moving parts are removable so cleaning this piece becomes an easier chore. The blade, food carriage, pusher, deflectors, and plate all come off of the main body. The thickness of the meat can be altered from deli-thin to 5/8 inches thick. To control this, there’s a knob located in the back. This slicer is belt-driven and works with a 150-watt motor for a quick job. 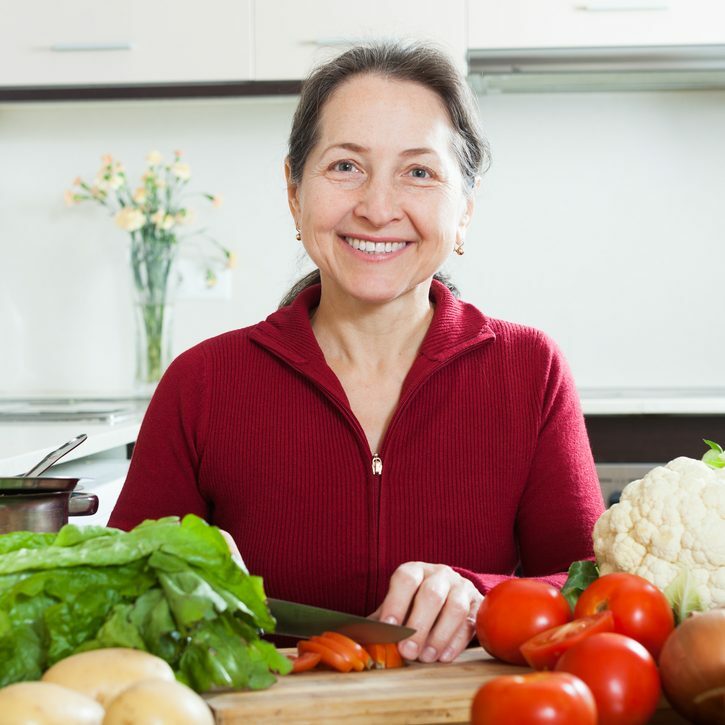 With this power, the meat slicer can slice through meat and veggies whether they’re soft or firm. The food pusher has a set of teeth to give you greater control and safer experience. There are suction cups on the bottom of this deli slicer to keep your unit fastened securely in one place. The carriage surface on this piece is lined with finger protection and an end-piece holder. This slicer comes with a stainless steel blade for precise cutting and consistent performance. The life of this blade remains long with rust-resistant material. You can additionally get a 9” bread blade and a 9” serrated blade for this model so your slicer can be used with more versatility. The best quality of this machine is how easily it can be cleaned with all the removable parts. This is an almost hassle-free task as moving over this piece is easy and quick. The one problem that occurs with this machine is that the position of the blade and carriage surface allows the meat to move on its own, which is inconvenient. With all the additional space, the meat can slip out of place and fall away from the blade. Chef’sChoice is a great choice for meat slicers. This slicer is electric powered and gear driven. The body is cast-aluminum with a 7-inch multipurpose stainless steel blade. The range of thickness for slices is from deli-thin to 3/4 inches. This unit houses a strong cool running high torque motor for a powerful and efficient job. This slicer comes with a large food carriage surface and a cantilever for a fast-producing job. This can hold larger pieces of the meat such as roast, steaks, and ham. The movable parts on this slicer are removable for a quick and easy clean after every use of this piece. This piece can cut through vegetables, bread, and cheese as well as it can cut through the meat. The tilted food carriage surface allows for a quicker job and more can be done at once. This Chef’sChoice slicer has additional safety features. The on/off button is highly responsive and there’s also a safety button to secure and fasten the food carriage surface. This ensures against unwanted blade movement when the unit is not in use. This model is compatible with both a serrated and non-serrated blade. Upon purchase though, you’re provided with a serrated blade. The non-serrated blade works better with cheeses and meat while the serrated blade works efficiently with bread. The non-serrated blade also works fine with vegetables and fruits. Issues with this meat slicer aren’t quite specific to one area. Instead, this unit just sometimes doesn’t pull the quality performance it’s supposed to which is why it can dissatisfy rather than please. One consistent problem is that this unit has a short lifespan compared to others. Other than this, this piece is convenient and comes in handy as a home appliance. For a commercial appliance, it may not be the best since it happens to create small issues often and this can be cumbersome for a business. Cuisinart provides users with a stainless steel piece for their kitchen requirements. This slicer has a 7.5 inch undulated blade for precise cutting. This piece has a knob control to adjust the thickness of your cuts from 1/32 inch to a thicker ½ inch cut. This appliance also has a gear drive. All of the moving parts can be removed for an easy and quick clean of this unit. This not only cuts through the meat but cheese and bread as well for more diverse usage. The body of this piece stands on non-slip feet for stable, tabletop performance. This machine works on 130 watts and comes with a five-year limited warranty on its motor. As a commercial-grade deli meat slicer, this unit works as a great home appliance. It provides users with a quick, quality cut with each piece of meat, cheese, bread, and more placed inside of the cutter. This Cuisinart slicer works slower than other slicers, but that doesn’t stop it from performing to qualitative levels. This piece does not work well on frozen foods though. An alarming issue with some sold pieces is that they came working with an odd loud noise emanating from the motor. Whenever this sound comes out, then it’s expected for the machine to completely fail. This is a very displeasing occurrence since overall, the machine works very well. This issue isn’t one to look lightly over as this can become a fire hazard or you could risk getting injured. When you get this unit model, check and inspect the performance and sound coming from the unit as soon as possible. Luckily, the warranty provided for this piece is targeted right to the problem which is the motor. This KitchenWareStation meat slicer appliance comes with a proud high quality 12” Teflon blade. This meat slicer is commercial grade and has a semi-automatic functionality. IT houses a 420 watt motor for a strong and powerful performance. With its power, it can cut more than just meat. You can now slice vegetables, bread, cheese, and fruits fluently and effortlessly with this appliance. The thickness of each cut can vary from paper thin to .6” thick. Provided with the primary purchase of this component is a dual whetstones sharpener and ring guard for the blade. The body of this slicer is constructed out of aluminum alloy for more durable performance and longer-lasting life. The Teflon blade in this model is a strong, rust-resistant, durable blade that slices and cleans so quickly you will be impressed. This blade is strong enough and slim enough to make quick, consistent and clean cuts with different thicknesses on all kinds of different foods. The sharpener for this blade is built into the unit for long, strong and quality performance. The on-off switch for this piece is waterproof and underneath the unit are four skid-proof rubber feet for a sturdier grasp on the counter surface. The carriage surface for this unit can hold larger pieces of meat with ease and leaves plenty of space for the completed slices. With the 420-watt motor, this slicer can work for longer periods of time than other slicers. One problem with this model is that the blade has a cool-down time after you turn off the whole unit. This means the blade may still spin even after you turn it off. This can be dangerous if you’re using this at home or when more than one person is working nearby the machine. 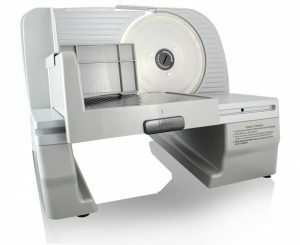 The final and top choice for a meat slicer is the BESWOOD250 which holds some promising features. This machine has a chromium-plated coating over its carbon steel body to better withstand the high temperatures the blade can reach. This blade stays sharper for longer periods of time than others and it isn’t liable to blunt against corrosion. With the additional coating, this blade doesn’t require constant sharpening so it’s guaranteed to last longer, withholding its strong, durable performance. Rather than a gear drive, this machine has a belt drive for its power source and a 240-watt motor. This unit works quietly and there’s less of a shock factor, making this machine easier to work with. This slicer has skid-proof rubber feet and a blade ring guard for greater safety precautions. As this is a commercial-grade meat slicer, it’s expected to work for longer periods of time and handle heavier duty jobs. It cuts through meat, vegetables, bread, and fruits with ease and can have their thickness altered to your liking changed with its knob. The BESWOOD all around is a great utensil to use when it comes to slicing up meat. The carriage surface provided on this piece is 12” long and 6” wide, plenty of space for large pieces of meat and other food items. When it comes to the performance, there’s nothing, in particular, to complain about. The only issue that happens, though not that often, is that the machine doesn’t turn on at all when bought. This could be a shortage in the circuiting or an issue with the outlet itself not providing enough power. With this issue, you may find a pattern such as a blade being loose on these pieces or the body overall seems flimsy. Other than this, the BESWOOD performs up to par and beyond when not used as a commercial appliance. It is fast, efficient and long-lasting when you receive the ideal unit BESWOOD wants to provide. 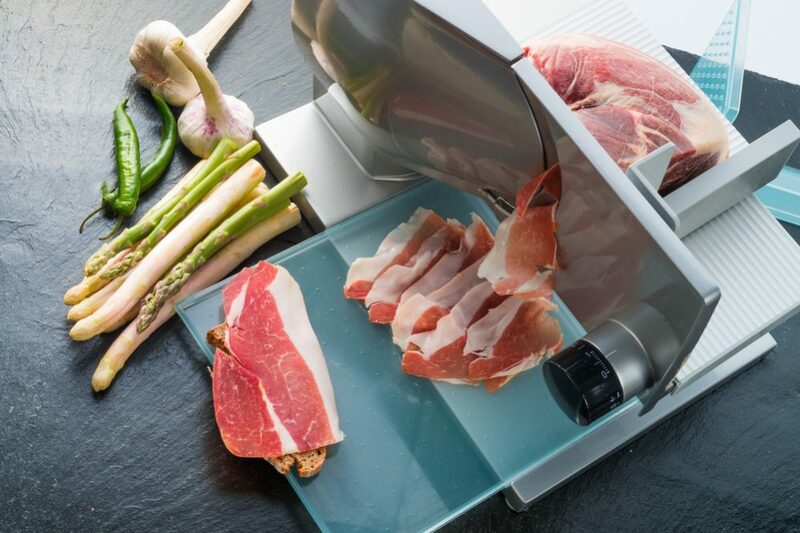 Meat slicers aren’t the most common choice when it comes to buying appliances in the kitchen, but they are very useful. If you find the right one or you, meals will be much easier to enjoy with thin slices of perfected meat. To find the right meat slicer you need to have some background knowledge on what a meat slicer is composed of. You should also know how to tend to the needs of a slicer to get the results you want. Meat slicers aren’t very high maintenance products, so long as you’re ready to keep a keen eye out on how much and how long you use it for. You don’t want your meat slicer to be too big. If it is, then it’ll become hard for you to store it away when not in use. If you’re using it for commercial purposes then it’s fine to have it out in the open. It’s going to be surrounded by professionals aware of the dangers when being near a slicer. If you plan on bringing it home for use in your own kitchen though, then it’s recommended to buy a smaller model. This allows you to store it out of unwanted hands while you’re not using it. If you have children in the house, then it’s really important to be able to stash it away. You also don’t want your machine to take up too much counter space since it’ll become inconvenient to work around it. It can also topple off of the counter if there isn’t enough space for it to comfortably stand. The price of your meat slicer should be between $100 and $400. This can get you a good standard machine. There will not be anything reliable under $100 and the better ones are closer to the $300 mark. Keep this budget in mind when you go looking for the right meat slicer. Naturally, since this piece is going to be slicing, you want something that is strong. The blade’s rotation will make the machine shake a little, but a good machine made out of stainless steel or cast-aluminum should be able to handle this. If you feel that the body isn’t strong enough, avoid that model since a weak body could result in the blade coming out. Cleaning your machine is very important. If you don’t clean your machine and leave food particles on the metal, serious bacteria development can occur over the metal. This can ruin all of the food you cut with this slicer. You can also get toxins inside of your food that can cause stomach illness. Just keep cleaning your machine persistently and you’ll never have to face these issues. It’s better to get a machine with separate removable parts so you can better clean through all of the nooks, crannies, and corners wherever food can find its way into. It also makes storing it easier since it isn’t one big, bulky body. There will be times when the packaging states which parts are dishwasher safe, so do keep an eye out for this. All the other parts that can’t go into the dishwasher can be cleaned by hand like any regular dish. Dish soap and some vigorous scrubbing is enough to get out the gunk and food particles. Let the parts dry out completely before you put them together and store them away. You don’t want your slicer to rust while you’ve stashed it in the closet. 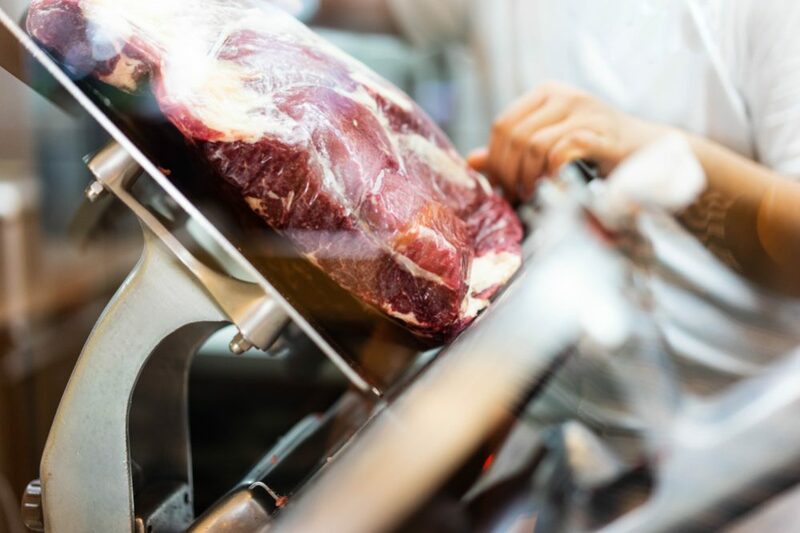 While you’re working on the machine, be sure to clear out any big pieces of meat that get stuck in the unit as soon as possible. Don’t forget to turn off and give the machine a break once in a while. Keep an eye out on your blade to see if it needs to be sharpened or not. Otherwise you’ll get a mess rather than clean cuts. When it comes to keeping the machine stored, make sure it’s in an enclosed spot where children can’t reach it. Cover it so that there’s no dust development over the moving parts otherwise the machine may not work properly the next time you use it. When it comes to performance, there’s nothing wrong with the BESWOOD250. This slicer manages to do its job with a strong-standing performance that is hard to top. It performs as it should with thin, consistent, and smooth cuts through not only meat but vegetables, fruits, bread, and cheese as well. 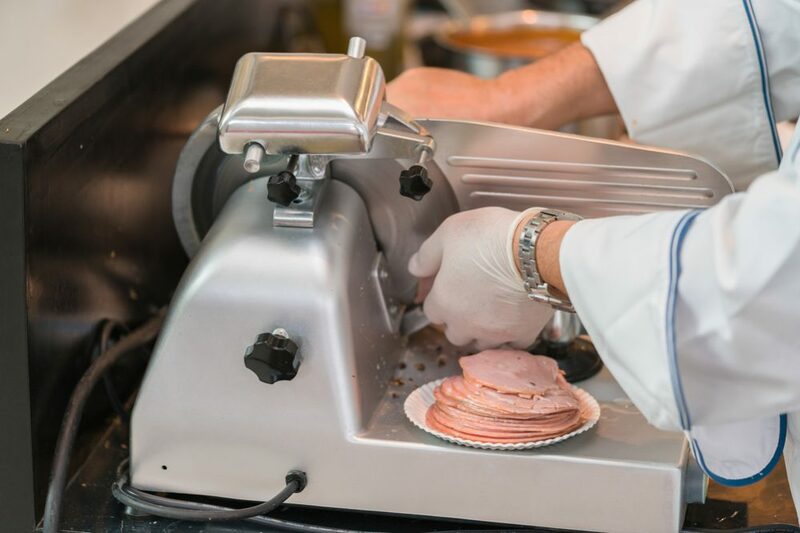 This slicer is long lasting and has taken the safety of the user into deep consideration with their rubber skid-proof feet and blade ring guard that keeps the sharpest part of the machine well away from your hands and fingers. The BESWOOD performs to a commercial grade standard, capable of taking long shifts without breaks and still pulling the top-notch result you want. When it’s made to work for the professional, the jobs you have in mind are baby food to this slicer.